Manley Domestic - Connecting Rods - White Smoke Motorsports LLC - "The Future of Performance"
Manley Performance manufactures the finest steel connecting rods in the industry. Manley Pro Series connecting rods are used by the very best engine builders in and outside of the United States in some of the fastest, high horsepower, heart stopping engines being produced. Manley Sportsmaster connecting rods are forged from aircraft quality 4340 material. Each rod has the entire beam and cap area profiled to remove stress risers and render the lightest possible rod. After machining, rods are shot peened and magnafluxed. Bores are round and without taper. Bend and twist is tightly controlled. 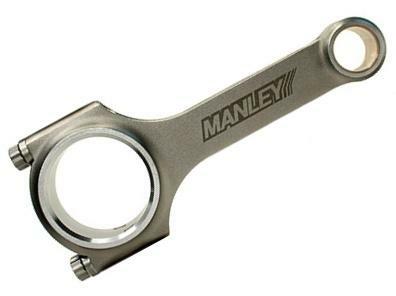 Manley Pro Series connecting rods are forged from aircraft quality 4340 vacuum degassed material. Each rod is fully machined to the highest standards. Our signature “Pro Series Lightweight” design combines the appropriate weight and rugged strength for ultimate horsepower applications. Each rod is shot peened after machining and magnafluxed. Bores are held to exacting tolerances. Bend and twist is tightly controlled. Cap fasteners are ARP 2000 alloy cap screws. Manley “H” Beam connecting rods are manufactured from 4340 forgings to the same exacting standards developed and approved by our original equipment customers. There is a vast difference in quality between a Manley “H” Beam and the “other” inexpensive H-Beams on the market. Weight matched to +/- 1.5 grams. Perfectly round big and small ends. Bend and twist is tightly controlled.